The 19th Pan Borneo Inter-Clubs Meet, which was hosted by the Rotary Club of Bintulu from 28-30 April 2006, ended with more determination and conviction to continue this event for many more years to come in view of its importance and significance in enhancing the close relationships between Rotary Clubs in Borneo particularly. 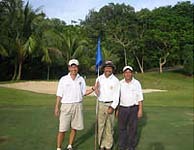 The event started on the afternoon of 28 April 2006 with golf fellowship at the well maintained, beautiful and challenging Bintulu Golf Club. This fellowship golf was organised by PP Sinsoon Jabu from the Rotary Club of Bintulu. Non-golfers were taken for a visit to one of the top ports in South-East Asia, the ultra modem and purpose-built Bintulu Port. There was a fellowship dinner on the first evening held at the Kidurong club hosted by Rtn. YB. Senator Hii Tiong Kuoh. An impromptu fund raising was also held during the fellowship dinner where nearly everyone purchased a RM10 ticket towards a lucky draw for 2 pieces of beautiful hand-stitched blankets produced by Rosemary, spouse to PP David Sukhdev of the Rotary Club of Miri. A total of RM2,000.00 was raised and channelled towards the 19th Pan Borneo project. Mr Pau Chiong Ung (2nd left) officiating the opening ceremony. Also present was DG Tay Kim Ann, OC PP Lee Lei Kiak (2nd right) and President Joseph Bong of R C Bintulu host club. The official opening ceremony was held the following morning at the Parkcity Everly Hotel. The guest of honour was YB Datuk Tiong King Siing and represented by Mr Pau Chiong Ung, President of the Bintulu Chinese Business Association. To our great and pleasant surprise, YB Datuk Tiong King Siing and Mr Pau Chiong Ung donated RM10,000 and RM1,000 respectively towards the 19th Pan Borneo project.